He would be a rash prophet who should assert that the expansive character of American life has now entirely ceased. movement has been its dominant fact, and, unless this training has no effect upon a people, the American energy will continually demand a wider field for its exercise. But never again will such gifts of free land offer themselves. For a moment, at the frontier, the bonds of custom are broken and unrestraint is triumphant. There is no tabula rasa. At the start of the 20th century, and particularly in the period between the world wars, architects and planners looked away from the density of the city fabric towards an alternative of dispersion. The following post briefly compares several such examples, visions of dispersion used as arguments from opposite political ideologies. Dolores Hayden tells the story of the expansion of suburbia as a private venture that encouraged individual enterprise, although it often resulted in ill-advised investment and frustration. The 19th century pattern books and plan books eventually evolved into the Sears catalogs in the first decades of the 20h century (1908-1914). This ‘kit-of-parts’ approach often deceived buyers as to the final price of the investment by offering a bare-bones product that required buying a lot of extras for a completed project, but its flexibility and ability to rapidly populate the land with houses-in-progress would be the aspiration of later utopias. However, these developments depended on infrastructure that would take a long time to arrive, and commuting distances and the lack of basic services made life difficult. The lots were laid out without provisions for public space, and the need for better planning eventually resulted in the creation of zoning ordinances during the 1920s. Later, in the 1930s, the Federal Housing Administration (FHA) would create manuals to advice architects on how to design subdivisions with larger lots and more green space, although this made the end result less affordable. Parallel to these private visions of dispersion, Francesco Dal Co tells us of the intervention of the state in the construction of workers’ villages during World War I. The policy was seen as an efficient strategy given limited economic means, but it was followed by accusations of socialism after the war. While Hayden gives an example of private dispersion as an example of entrepreneurship, Dal Co shows how town building in the 1920s was taken up by the state through the Regional Planning Association of America (RPAA). According to Dal Co, the RPAA’s ideology was influenced by Geddes and the European descentralist tradition including Kropotkin and Howard, resulting in a synthesis that was both pragmatic and idealistic, dedicated to civic reform, and connected to values identified with the United States such as individuality and democracy. …at the time there still seemed to be no alternative to the Western idea of a city conceived as a center of habitation and production; subsequently this very conception was to be questioned and the view expressed that “the city” was an archaic and obsolete model inseparably linked with the capitalist philosophy of production. These descentralized visions of democracy resemble the socialist disurbanist vision of M. Okhitovich, presented in Moscow in 1930. The disurbanist city was to be based on a grid of power stations scattered throughout the territory of the Soviet Union. The grid would allow an equal distribution of factories in order to establish industrial centers and allow the population to spread evenly, eliminating the difference between city and countryside. The disurbanists distanced themselves from the ‘urbanist’ group by arguing against communal houses and proposing instead lightweight prefabricated houses, easily assembled and dismantled, to adapt to different living conditions (bachelorhood, marriage, family, divorce). Communal social activities and separation of the children were reminders of the collective nature of the socialist state. 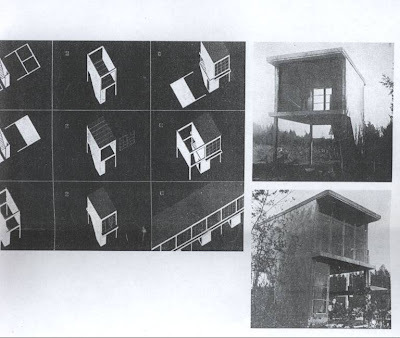 These ideas were applied in Ginzburg and Barshch’s Green City, a proposal for the dispersion of Moscow first published in SA in 1930,which included drawings for these prefabricated units. Aesthetics aside, these units can be compared to the sears catalog houses as similar examples of a typology of small prefabricated units intended to be deployed on a low density landscape. In his analysis of the development of Soviet urban planning from 1917-1928, Tafuri concludes that soviet proposals fit one of two equally useless paradigms: either a more or less romantic empiricism or the artificial universe of the avant-garde. Sakulin’s dispersion strategy for Moscow, for example, is read as a formalist exercise that is more dependent on the availability of land and the anxiety to socialize the territory, than on real analysis of the industrialization program or the overall economic strategy (Tafuri 156). The land as an ‘unprecedented theoretical field for experimentation’ was a characteristic shared with proposals from the United States. For example, Ivan Leonidov’s proposal for the new city of Magnitogorsk bears a resemblance to Wright’s Broadacre City. To reiterate: the basis of the whole is general decentralization as an applied principle and architectural reintegration of all units into one fabric; free use of the ground held only by use and improvements; public utilities and government itself owned by the people of Broadacre City; privacy of one’s own ground for all and a fair means of subsistence for all by way of their own work on their own ground or in their own laboratory or in common offices serving he life of the whole. Frank Lloyd Wright’s Broadacre City of 1932, is described as a continuous but porous or dispersed ‘city’ in which the grid provides a constant background of infrastructure and communication while the plots highlight variety and individuality. The dispersed quality of the proposal makes it rely on technological innovations for communication and production. By eliminating the city, Wright hopes to eliminate government to a minimum. The architect is designated as the agent of the state, chosen by each county and resulting in a purported individuality that is nevertheless subject to the invisible rule of Wright’s organic architecture. Architecture is elevated but at the same time fragmented and de-scaled (everything is described as ‘little,’ see Wright 247). In supporting a maximum of independence and individuality, themes such as economics and class differences are ignored or assumed as resolved. Kopp’s conclusions on the utopian character of these disurbanist proposals and the damage they inflicted to the cause of city planning align with Tafuri’s disapproval of their formalist nature. However, both should be contrasted with the rural dispersion going on a few years prior in the United States, which offered a formally similar solution of small lightweight and transformable houses while arguing individual entrepreneurship instead of collective efficiency. Both Turner, talking about the USA, and Tafuri on the USSR, seem to come to the conclusion that the impulse to cover their respective vast territories might have been more important than any ideological justification. Perhaps in the end it is the common element of the land as experimental field that unites both ‘communists’ and ‘capitalists’ in their need to expand and occupy the landscape. Turner, Frederick. “The Significance of the Frontier in American History,” in The frontier in American history. New York: Holt Rinehart and Winston, 1962, p. 38. Hayden, Dolores. “Mail-Order and Self-Built Suburbs,” in Building suburbia: green fields and urban growth, 1820-2000. 1st ed. New York: Pantheon Books, 2003, pp. 97-127. Dal Co, Francesco, “From the First World War to the New Deal: The Regional Planning Association of America,” in Ciucci, Giorgio, et al. The American city: from the Civil War to the New Deal. Cambridge, Mass. : MIT Press, c1979, pp. 221-260. Tafuri, Manfredo. “Toward the ‘Socialist City’: U.S.S.R., 1917-28,” in The sphere and the labyrinth : avant-gardes and architecture from Piranesi to the 1970s. Cambridge Mass. : MIT Press, 1987, pp. 151. Frank Lloyd Wright, “Broadacre City: A New Community Plan,” Architectural Record 1977 (April 1935): 254. Kopp, Anatole. “Town and Revolution,” in Town and revolution Soviet architecture and city planning, 1917-1935. New York: G. Braziller, 1970, p. 165. Also see Ginzburg, Moiseĭ I͡Akovlevich. Style and Epoch. Cambridge, Mass: Published for the Graham Foundation for Advanced Studies in the Fine Arts and the Institute for Architecture and Urban Studies by MIT Press, 1982.